Good morning from a beautifully sunny and autumnal Crystal Palace. The leaves on the trees (how very Wordsworth) along Crystal Palace Parade are changing colour leaving us in no doubt what season we are in. It’s turned noticeably cooler too, with a definite chill in the air as we walked back from the bus last night. Anyway, back to Sunday. After sending the last blog on it’s way to it’s various and no doubt ecstatic recipients we had a lazy afternoon drinking tea and devouring a pack of digestives. Friends had arrived after enduring a tortuous journey through South London thanks to a fire and subsequent road closure that added over two hours to their journey from Brighton. We slurped, munched and chatted for a while then headed off to get freshened up for our chosen evenings excursions. We ended up at another Wetherspoons – one considerably cheaper than their offering at the NEC – and devoured a couple of Sunday roasts. Not each, mind you, even though we ‘went large’ the plate wasn’t exactly overflowing and clearly there was a supply issue in the carrot department. What’s there was tasty enough though and we both opted for another pint as dessert. We didn’t stay out long, pausing on the way back to catch the end of the live jazz at the Grape & Grain. A little reconnaissance on the way unearthed a couple of other watering holes to try during the week. ‘Downton Abbey’ on the telly accompanied by some cheese & biscuits and a small (honest) glass of port brought the day to a close. Monday, and the day of our tour of parliament. 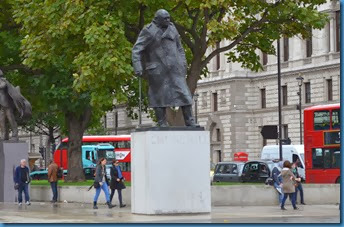 The rain stopped long enough for us to get to the bus stop of the usual number 3 but was soon making it’s presence felt us we trundled through Brixton and across Lambeth Bridge and around Parliament Square. 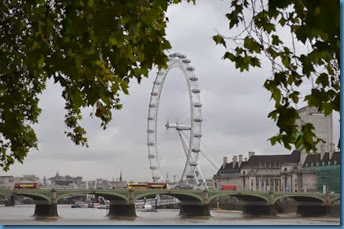 We’d left plenty of time so despite the traffic we had arrived ell ahead of of scheduled tour time and ambled back to Victoria Tower Gardens for a view across the muddy Thames to the south bank and the London Eye to our left. Airport style security was in operation and for once it was Trev that set off the buzzer instead of me. Formalities completed we were soon in the The Westminster Hall awaiting the start of the tour. An architectural feat at the time – it’s some 900 years old – it’s still pretty impressive today. The roof was replaced with the current design in the 14trh Century and remains the largest hammer beam roof in the world. 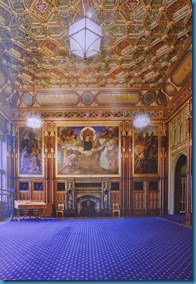 As well as the main visitor entrance, the hall also hosts state and ceremonial occasions. Apparently as well the usual security sweeps the structural integrity of the massive roof is checked and an inch by inch examination was made when Nelson Mandela visited a few years back. A less thorough check was made when Barack Obama turned up more recently and when the leader of the opposition in Burma appeared, they couldn’t be arsed. True or not it’s a good yarn. We visited the robing room where her Maj prepares for the State opening of Parliament. Subtly concealed behind one of the wooden panels is a little cubicle where any pre-match nerves maybe, er, dealt with. A Royal flush presumably. 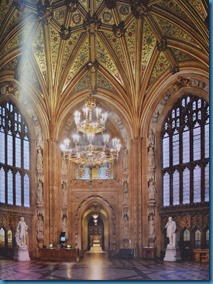 Anyway, next up was the Central Lobby which joins the two houses (Lords & Commons) together. 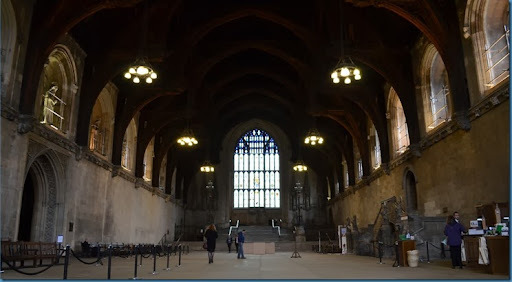 The Central lobby is open to the public and is a place to meet your MP – in fact if you turn up here – and he or she is in the house – they are obliged to come and see you. It is also a popular spot for nightly news reports although is much smaller than it looks on the telly. 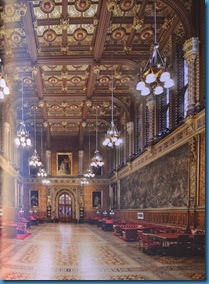 The Lords Lobby and chamber were next. Two voting lobbies run along either side of the main debating chamber and attendees walk from one side or the other depending on which way they vote. 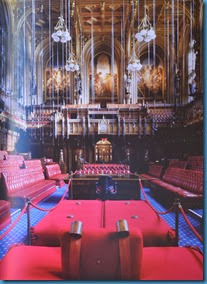 The Lords chamber, whilst similar to the Commons is distinguishable by the colour of the seating. Red. Not to mark any political affiliation but to indicate the (then) superior status and power of the Lords. Red was (and apparently still is) more difficult and expensive to reproduce. Along with blue. Interesting that our two main political parties, who both claim to represent ‘the people’ use these colours. Maybe that tells you all you need to know. Or maybe not. Almost last was the Commons chamber. It was great to stand in there, in the very place where political debates have raged for hundreds of years. If you go on a tour – and I highly recommend it – you will be surprised how small the chamber is. 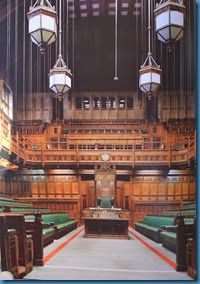 Visitors are allowed to come and watch debates from the public gallery – in either house – and although now separated by a sheet of Perspex the atmosphere, our guide said, can be electric. I don’t doubt it and would love to come again one day. Sadly photography was banned almost everywhere. I’m normally happy to ignore rules like this, but with armed police in every corner it seemed better for my health to comply. So, we’ve cheated another way. 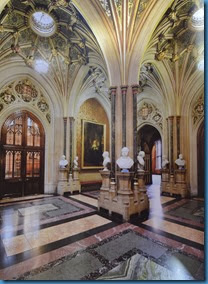 The photo’s you see – of the interior anyway are taken from the guide book. I’m sure there’s some copyright issue here but what the hell! The tour last about 90 minutes and I can thoroughly recommend it – but book through your MP like us and you won’t have to pay. Our guide was entertaining and informative. And having toured the parliament buildings in both Australia and New Zealand some years ago, it was nice to finally see our own – the place and set up on which most democracies are based in some form or other. We had hoped to join our MP for tea and a chinwag on the terrace overlooking the Thames, but constituency business back in Brighton meant that her had to cancel. The rain had ceased as we emerged back on to the street and headed over Westminster Bridge to grab some photo’s before joining the number 3 bus back to the site. Tuesday, and a pretty chilled day, the only excursion being to the shopping parade late afternoon, once the rain had ceased to procure some of those bits and bobs that you always seem to need when caravanning. Plastic storage tubs where top of the list – oh the excitement – but having taken the car up we resisted the lure of an afternoon pint, knowing full well that it wouldn’t have stopped at one! Wednesday brought with it more rain but the skies were clearing as headed in to town again, this time for a afternoon play along the Strand. WE hopped off the faithful number 3 at Whitehall and waited for the number 11 that would take us up around Trafalgar Square and along the Strand. WE new from previous visits that the new ‘Route Master’ buses could be found on this route and sure enough one pulled up. We boarded at the front, and headed upstairs only to find there was no seating left and came down the back stairs. Our experience was short lived as the driver announced that there was severe traffic delays due to roadwork’s up ahead and we’d be better off walking – which we did. We were on the bus less that two minutes! Having located the theatre – and it did only take five minutes – we adjourned to a pub nearby for a sarnie and some research. The research took it’s toll in the first half of the play as I nearly nodded off. The second half was better but not one of our favourites. For the record, it was ‘The Lady Killers’ and I’m glad the tickets were half price. We met a friend for some grub and grog after the show at the pub we’d had lunch in. Interestingly the clientele had changed almost entirely from tourists to suits with ties dangling at half mast or completely absent. It was also a lot noisier and we moved on elsewhere and had a good nosh and catch up. So, there we are, up to date again. The sun remains out and with a rotten day forecast for tomorrow we’re going to get the awning down later on, before our departure on Saturday. An evenings ‘research’ has been mooted and we have tickets for ‘We Will Rock You’ on Friday night in town. We’ve seen it before, although over ten years ago, but thoroughly enjoyed it.